Whipped up, fried and served to the world like a steaming order of grits on the hotplate of Atlanta, Andre Benjamin struggled through a youth filled with drug-dealing and little hope for the future in a poverty-striken neighborhood; a change to this trajectory, however, took place during his high school years, when he met musical collaborator Antoine Patton. 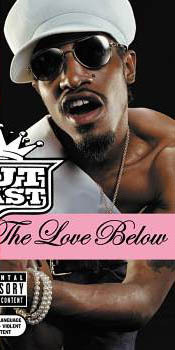 Initially competetors in wordplay, Benjamin (using his nickname "Dre", and later "André 3000") and Patton (using the name Big Boi) eventually joined forces and formed OutKast. The duo's blend of rap and funk attracted the attention of the production team Organized Noize, who, along with the local rap crew Goodie Mob, brought them in as part of the Dungeon Family music collective. A contract with the R&B label LaFace was arranged in 1992, and a contribution to a remix of the track Ain't 2 Proud 2 Beg by stablemates TLC followed soon afterwards. Outkast's first single Player's Ball (also included on a LaFace Christmas collection) was then released by the label in 1993, and subsequently made an unexpected jump to the top of the rap charts. The enthusiasm that greeted Ball was a clear indicator of the response that awaited their 1994 full-length debut Southernplayalisticadillacmuzik, and the album accordingly racked up platinum sales shortly after its release. A second release, ATliens (1996), delved even more deeply into the band's funk roots and confirmed their status in the corporate music scheme by once again going platinum, as well as launching the single Elevators (Me & You) to the top of the rap charts and into the mainstream top 20. This success was then surpassed by the double-platinum sales of the zodiac-inspired Aquemini (1998), although the album's featured single Rosa Parks (named after the 50s civil rights activist, although having little to do with her in its content) did not quite have the impact as those on the previous two albums. One listener who was clearly left unimpressed by the track was Rosa Parks herself, and a series of lawsuits and appeals against Outkast (and ultimately their label LaFace) were pursued by Parks before a settlement was finally reached in 2005. This rapid climb up the celebrity escalator continued with the duo's multi-platinum fourth album Stankonia (2000), which made the usual climb to the #2 position and launched three well-received singles: B.O.B. (Bombs Over Baghdad)), Ms. Jackson (their first mainstream #1), and So Fresh, So Clean. After filling in a hiatus from recording with a greatest hits collection augmented by three new tracks (Big Boi and Dre Present...OutKast, 2001), the two Outkasts divided their efforts for their 2003-released fifth album, each assembling half of the record independently of one another (Big Boi's half being titled Speakerboxxx and André's titled The Love Below); an even more diverse range of influences were drawn upon (particularly on the The Love Below half of the release), earning the pair their most enthusiastic critical and audience responses yet. In the midst of the media buzz surrounding Stankonia, André (not surprisingly) initiated a parallel career as an actor, begining with a voice-only contribution to the dubbed version of the 2001 martial arts flick Whasango (also called Volcano High). This was followed by a supporting role in the police/comedy/thriller Hollywood Homicide (2003) and an appearance as the owner of a comic book shop on the televison cop series The Shield (2004). After this tentative start, the musician subsequently went into an acting frenzy in 2005, appearing in the Get Shorty sequel Be Cool, starring opposite Big Boi in My Life in Idlewild, taking the lead role in Four Brothers and a prominent role in the crime drama Revolver, and lending his voice to a celebrity-riddled remake of the anti-pork children's story Charlotte's Web.